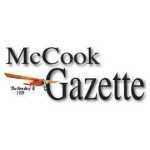 McCook's softball team knocked off No. 1 Elkhorn South, 9-5, at the Class B state tournament on Tuesday. The Bison play a 2 p.m. game today against York or Hastings. More details to come.